Life is the manifestation of your old karmas of past lives. 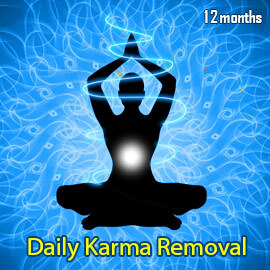 DKRP is a comprehensive, intensive, and personal approach, to eliminate every kind of karma that affects and limits you. This Soul-Cleansing 12 months Remedy Package is designed for those of you who are committed to purifying and transforming all areas of your life. This new program is a combination of the most powerful and effective means to remove karma, and change your destiny.